Clinton’s memoir about her 2016 presidential campaign run is the buzziest book of the month. 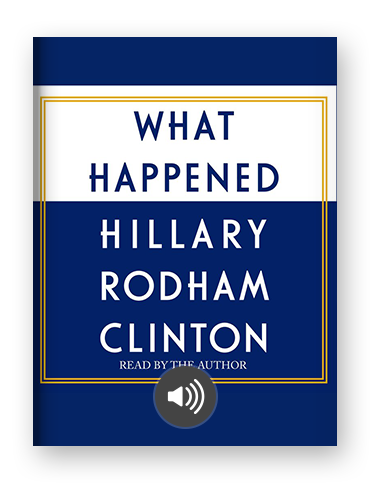 This audiobook is an unprecedented look into an unprecedented election cycle, read by Clinton herself. The latest from the author of The Happiness Project will help you understand how you — and your coworkers, spouse, and friends — respond to expectations so you can carry through on more projects, both professional and personal. Everybody’s favorite hacker — the fiery, no-nonsense, dragon-tattooed Lisbeth Salander — is back in this continuation of Stieg Larsson’s Millennium series. Rushdie melds together Greek tragedy with American myths and dreams to stunning effect in his latest novel. Many critics are praising it as one of his greatest novels. If you’ve never read any of Jesmyn Ward’s work, you should correct that right now. Her latest has been longlisted for the National Book Award this year. Mark Manson’s anti-self help book has turned into the self-help book sensation of the year. In the overcrowded, oversaturated, over-clichéd self-help genre, this is a book well worth whatever f*cks you can muster. Thanks to Shetterly’s blockbuster book, the black female mathematicians whose calculations were critical to winning the space race in a still-segregated America are a hidden history no more. A crucial story that challenges our conceptions. Mukherjee is the author of the Nobel Prize-winning The Emperor of All Maladies, a study of cancer that brought science from multiple disciplines into a readable and humane work of scholarship. The Gene achieves the same goals, making the study of genetics comprehensible to dilettantes and scientists alike. This family saga from the always-humorous Patchett explores how actions, big and small, bind us through decades. Patchett has many award-winning and beloved novels under her belt already, and Commonwealth ranks as one of her best yet. If you need a thriller to kick off this Halloween season, look no further. As you can see from this and the aforementioned The Girl Who Takes an Eye for an Eye, the Girl in the Mystery Novel trend is alive and well — and for good reason.